» Characters from DFW #3: ARTY BEELE – by Monte Herridge. Characters from DFW #3: ARTY BEELE – by Monte Herridge. #3. ARTY BEELE, by Ruth & Alexander Wilson. 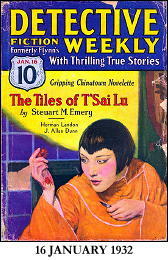 The Arty Beele stories by Ruth and Alexander Wilson were a short series of at least sixteen stories (some short stories and some novelette length) published in Detective Fiction Weekly from 1928 to 1932. There could be more. The character’s full name is Arthur Welliver Beele. The series involves the exploits of a hardboiled newspaper crime reporter in the Prohibition era. The stories are a bit hardboiled, too; an early example of this type of story. Beele is not afraid of gangsters and racketeers; he associated with them considerably and they gave him good stories. This doesn’t mean that all criminals liked him. Beele would without any compunction insult a known criminal and act unafraid of the consequences. In a number of the stories, John Ryan, captain of the homicide squad, leads the investigations and somewhat disapproves of Beele, but lets him ask many questions. Harrington, the Telegraph newspaper’s city editor, is a friend of his. 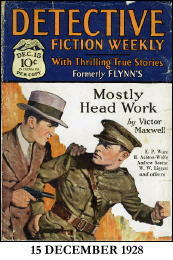 In the first story in the series, “Killers Have Blue Eyes” (December 15, 1928) Beele tells Hymie Jacobs, a known gunman, that he is yellow. He also notes that killers always have blue eyes, and Jacobs doesn’t. The story is a simple one where Jacobs’ enemy, another gunman, is killed. Beele knows that Jacobs didn’t kill him, and suspects who did. But Beele convinces Jacobs to confess to the killing. “The Silent Witness” details the aftermath of a killing of Brady, a gangland leader, supposedly by his girl friend Floss Jordan. But Arty Beele sees something that others don’t see, and believes she is innocent. He plays this up in his newspaper writings, and gets a lawyer friend of his to represent the accused woman. Part of the story is a relation of the court trial, and its results. “A Ride in the Park” does not involve a mystery, but does involve a murder. When gangster Tony Costello arrives back in town, Arty Beele expects that he will be killed by enemies. When a killing does take place at the train station, Beele jumps to the conclusion it was Costello and writes up an article about it. The piece was not complimentary to Costello, and he it turns out was not killed. Costello waylays Beele and takes him for a ride, intending to kill him. Beele manages to wreck to the car and kill Costello. A very close call for Arty Beele. “Death in the Dark” is a longer story than many others in the series, being of novelette length. It is a better story, as it enables the author to spend more time on details and the characters. Beele is sent by Harrington, his editor, to the house of a rich man who has been mysteriously shot while a police patrolman was not too far away. The only witness is too drunk to tell anyone anything, and there seems to be no place that the murderer could have gone after the crime. The crime was a complicated scheme to provide an alibi for the murderer, and it takes Arty Beele to see through it. He had the cooperation of Captain Ryan here. “This Way Out” doesn’t involve a mystery, although someone is murdered in it. One of Arty Beele’s gangster friends named Al Donner is in trouble with the law for a murder. Beele doesn’t believe he did it, although he knows that Donner did murder someone else a short time before. So Beele gets Donner a lawyer to defend him in court, and backs up Donner. Beele feels an obligation to Donner because Donner saved his life once. This is another novelette length story. “A Pain in the Neck” is a murder mystery where Arty Beele is involved with the police in solving the case of a fight manager who has been strangled. The obvious suspect is the manager’s boxer, but Beele sees clues the others have missed and points out the correct killer. 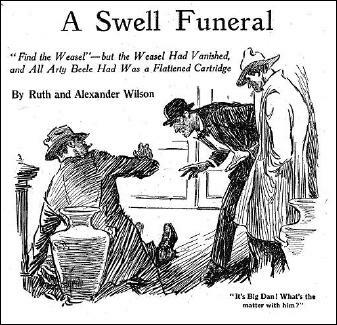 “A Swell Funeral” involves the murder of a racketeer leader at his recently opened nightclub, the Club Seville. Arty Beele is a friend of the racketeer, Dan O’Malley, and happens to be in the club at the time that he was killed. Strangely, no one saw the shooting at the front door where O’Malley fell dead. Captain Ryan is soon on the scene, and Beele insists on being a part of the investigation. Various other men, some of them racketeers also, come under suspicion. As usual, Beele comes up with the solution, with the cooperation of the police. “Special Delivery” is of novelette length, and is a story of gangsters and the newspaper. Scarron, the local liquor racketeer, has told Arty Beele that he will retire from bootlegging and move to a foreign country. However, a fellow newspaperman of Beele’s named Slim Stengel was shot supposedly by gangsters near Scarron’s home. Considering that Stengel idolized Arty Beele, Beele feels obligated to do something about the matter. “The Murder of the Seven-Year Itch” involves another gangland killing. Al Toriano visits Arty Beele in the newspaper newsroom and gives him some stock certificates to cash in and dole out the money to a beneficiary. Toriano says that he will probably be killed by other gangsters shortly. When both Toriano and his beneficiary are found shot in suspicious circumstances – it looks like they killed each other – Beele stirs Captain Ryan to investigate the matter more thoroughly. Beele of course helps the investigation, and coincidentally comes across the two killers a short time later. “The Picture of a Crime” involves Arty Beele in the murder investigation of a rich man in his mistresses’ apartment. In this story, Harrington, the Telegraph newspaper’s city editor, assigns the news coverage to him and a photographer. Once on the scene, Beele begins acting like one of the investigating police, asking questions of the suspects and others. There is no real mystery about the murderer, since there are only three suspects. “Live Bait” is different than other stories in the series. The story opens with Beele getting a tip-off from an underworld connection that he is going to be the target of a local crime lord, who means to kill him. Beele heads to Captain Ryan’s office to tell him the news, and together they come up with a plan to trap Orsini the crime lord. No mystery or murder to solve in this story. “Strike Three!” is a novelette length story that involves Arty Beele in the planned killing of one liquor gangster by another. One of the gangsters tips off Beele that he will kill an unnamed gangster, and Beele tries to figure out who the victim is to be. He winds up at the Club Chanticleer investigating. He is asked by Mike O’Mara (the intended victim), to sit in on a meeting between him and Repetti. “It was no new role for him to act as arbiter at a gangster conference.” When O’Mara and Repetti are both murdered, it is Beele who straightens out the confusion as to who killed whom. “Devil’s Brew” is something of a mystery combined with gangdom interactions. Beele is called in by two of the local liquor barons to help arbiter a problem between the three local liquor barons. Captain Ryan interferes with this work, and all of a sudden one of the barons is mysteriously shot and another disappears. Arty Beele investigates, and puts his life in danger in order to solve the problem. “The Fragrant Alibi” is another story where Beele assists the police in the solution of a crime. No Captain Ryan here, though. Beele is in a nightclub when a gangland murder takes place, and is involved in the story before the killing takes place. As often is the case, a small clue points out the solution of the crime to Beele. “Cheap at the Price” has Arty Beele investigating another gangland killing, and he is also under threat from the gangster suspected in a number of other killings. Another novelette length story. “Twenty Grand” is the last story found in the series, and is a good one. There is no murder mystery here; the culprit is known from the beginning. Blacky Frey, a gangster, has killed two people with his .22 rifle. One of these was a policeman, for which he was tried and acquitted due to lack of evidence(the police couldn’t find the rifle). However, Arty Beele thinks up a scheme to have the police catch Frey red-handed with the rifle committing a crime. This is an average series, with some very good stories, but mostly average or slightly above that. The best stories are the novelette length ones, because they have more scope for description and action and complexity. There is no element of humor in the stories, and the hardboiled nature of the stories denies any lightness to them. This series about a crime reporter does not measure up to the later crime reporter series that Richard Sale wrote about Daffy Dill. Daffy Dill was a longer running series and much more popular than many other series in DFW. NOTE: Thanks to Phil Stephensen-Payne for helping put together this checklist of story titles. The cover images also came from his Galactic Central website. Please visit! Where is David Vineyard? I’d love to hear his input on this latest entry in Monte’s truly amazing series. I wish I had actually read all the stories in the boxful of DFW pulps I owned at one time. I was only interested in Herman Landon at the time and sometimes Anthony Rud. Then I sold them all when I was done. Ah well. Currently, I’m working my way through the rest of my Isabel Ostrander books. She was a regular Argosy All-Story contributor. Some of her stories were gripping and clever and the detective story bits were very much top-notch though she tended to use some bizarre and fanciful ideas. For instance, an anonymous note made with macaroni letters in The Twenty Six Clues and acrobat criminals appeared at least twice in other books. I’ve not heard from David Vineyard in a while, and I’m with you in wondering what he might have said about some the recent posts on this blog, including this one. His previous absence was caused by back problems even worse than mine; perhaps they’ve recurred. I have some of Isabel Ostrander’s books in hardcover, but she’s an author I’ve never read. You make her sound as though I really ought to! Thanks for this latest article on another series from Detective Fiction Weekly. Many years ago I read a couple stories by Ruth and Alexander Wilson but was not impressed. I’ll have to try another and see if I like them any better at this stage in my life. The combo of Ruth and Alexander Wilson (a married couple?) also produced one novel, The Town is Full of Rumors (Simon, & Schuster, 1941). 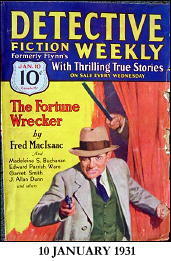 The reason I remember it is that it was later published as Death Watch (Ace Double D-89, 1955), but I’ve never read it. If you give one of their pulp stories a try, Walker, I hope you’ll report back here! WOW ! Those boys at Galactic do a lot in covers ! So far I know, the Galactic website is the creation of only one man, Phil Stephensen-Payne — albeit with lots of people sending him info, including covers. I don’t think he sleeps. If you are a big book or magazine collector, then one of the things that you are constantly doing is fooling around with your books and magazines. Stacking them, moving them, lifting boxes, indexing, cataloging, reading, bending down, etc. Having back problems can be a real problem because when you throw your back out, all you can do is lay in bed and maybe read through the pain, but you can’t do the other duties involved in being a bibliomaniac. Two of the most disabling episodes I ever suffered through, occurred just before pulp conventions. I still managed to attend both of them, walking bend over and in pain, but I then had to go on sick leave for a few weeks and not work. But the quest for books and magazine wants, still drives us on. The criticism from wives, friends, relatives, can be ignored. Even when non-collectors scream “Hoarder” at you, somehow you can carry on the work of saving books and old pulps. Only death can stop the Collector. In Comment #4, Steve urges me to report back if I get around to reading one of the Arty Beele stories. I am happy to say that I survived the experience and actually enjoyed the story, “The Murder of the Seven Year Itch” in the January 31, 1931 issue of DFW. It was hardboiled but unlike Monte who found “…no element of humor in the stories…”, I found some humor. The humor is hinted at in the witty story title and Arty solves the crime because of the murderer having fleas from the victim’s dog. We are not talking about Chandler or Hammett quality here or even Nebel, Roger Torrey, or Norbert Davis quality. In fact, we are probably talking somewhere around Carroll John Daly quality. But still, I have to admit, that’s better than what I expected. Keep them coming Monte and Steve!